Manchester City are ready to pay £100m+ to reunite Lionel Messi with Pep Guardiola at the Etihad in the upcoming transfer window. The sensational switch to bring the five-time winner of the FIFA Ballon d’ Or from the Nou Camp to Manchester, is finally set to happen, with City believed to have already agreed to meet the buy-out clause in the superstar striker’s contract. 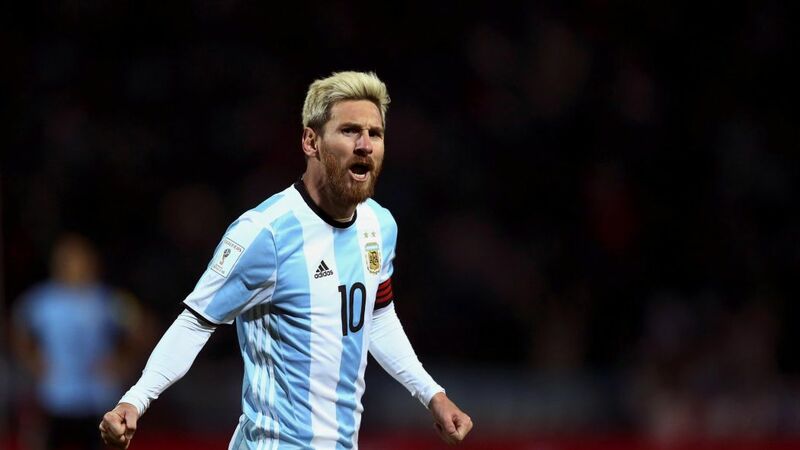 Messi in the light blue and white of Argentina – could he be wearing the sky blue and white of City next season? Sources close to City claim the talismanic Argentine striker will not renew his Barcelona contract which expires in 2018, leaving the Catalan giants with no option other than to sell their prized asset this summer. 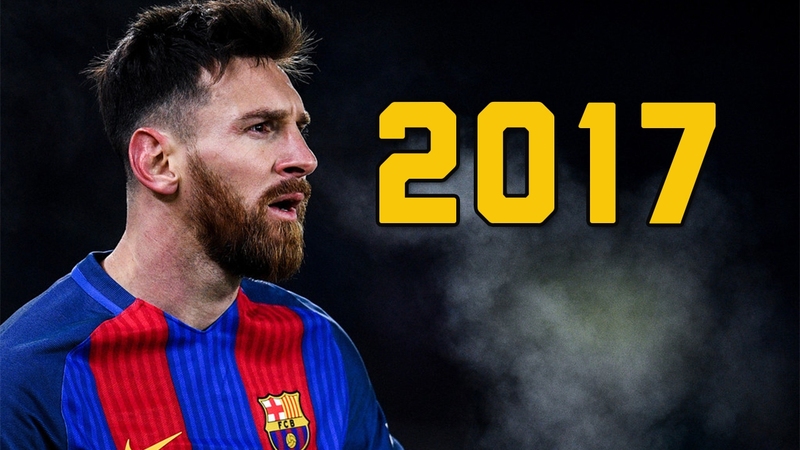 Messi – who turns 30 in June – has long been the subject of speculation linking him to City, but what was always viewed as ‘pie-in-the-sky’ wishful thinking, is set to become reality, as Guardiola embarks on a huge spending spree to transform City into genuine Champions League contenders. News of City’s alleged Messi intentions has emerged from a source close to the City Football Group (the holding company for Manchester City, New York City, Melbourne City and Yokohama F. Marinos, under the Abu Dhabi United Group – ADUG) over in the United States. Rumours are filtering out that Messi will not be playing for Barcelona in 2018. The transfer fee would easily eclipse the £89m paid by Manchester United to Juventus for Paul Pogba. There are those who might query the wisdom of such a huge sum for a 30-year old – but this is Lionel Messi we’re talking about here. Scorer of 337 goals in 373 La Liga appearances since his Barcelona debut in 2004, Messi has scored over 500 career goals for club and country, holding the records for the most in a La Liga season (50) and a club season in Europe (73), as well the record for the most assists in La Liga and the Copa America. Not only is Messi unquestionably still one of the best footballers – if not the best in the world – his commercial value to any employer remains astronomical, with a huge global audience fully appreciative of the mesmerizing skills of the Argentine genius. Opponents or team mates? 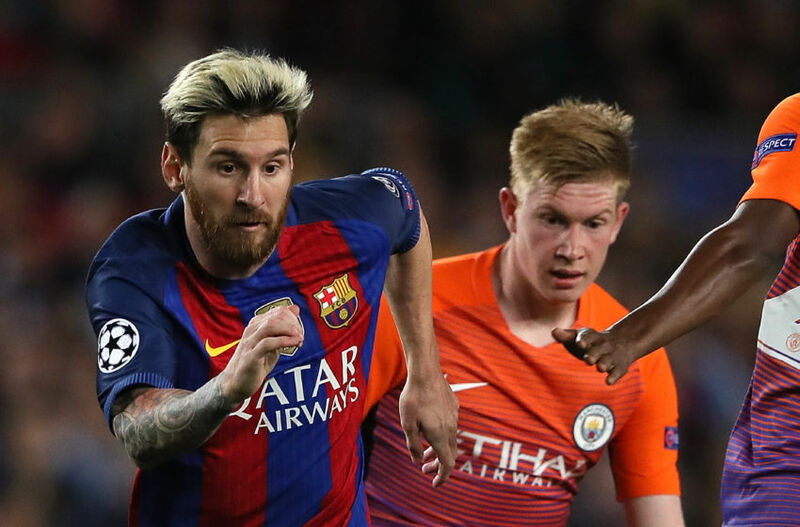 Is it conceivable that Lionel Messi and Kevin De Bruyne could both be in City colours in 2017/18? 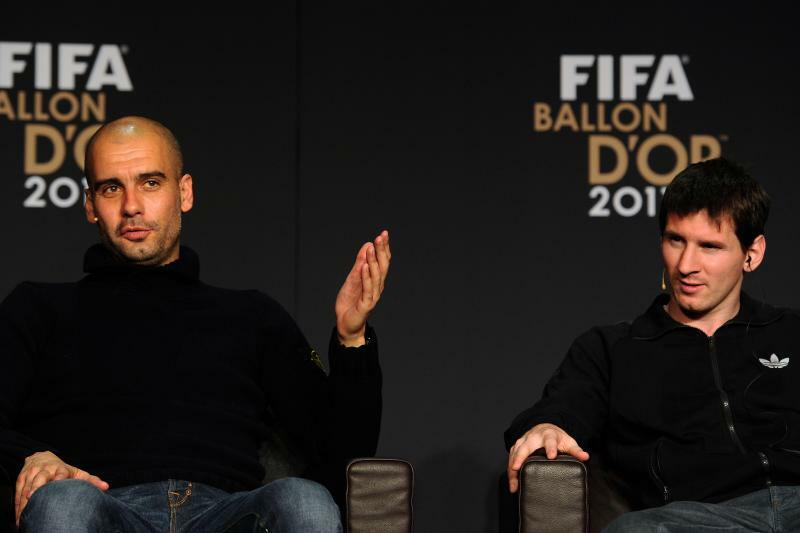 When questioned earlier this season about any possibility of Messi coming to City, Pep Guardiola laughed off the prospect saying ‘Messi belonged in Barcelona’ and would remain there for the duration of his career. After 17 years at the Nou Camp it would undoubtedly be a huge emotional wrench to leave, and even with the rumours leaking from the CFG, it still seems implausible. But, as clichés go, ‘football is a funny old game’ and ‘nothing should surprise you in football’. Rewind and Fast Forward – Pep Guardiola and Lionel Messi could emulate their glories of the past in the future at City. Tax fraud charges and court cases involving Messi and his father, led to both receiving suspended 21 month prison sentences last July, after months of anxiety and unwelcome media attention. Coupled with stories of Barcelona needing to balance the books to meet the wage demands of Messi, Neymar and Suarez, fund new incoming transfers to replace the likes of the legendary Andres Iniesta, and finance the £500m redevelopment of the Nou Camp, it’s clear something will have to give in the fiscal sense. 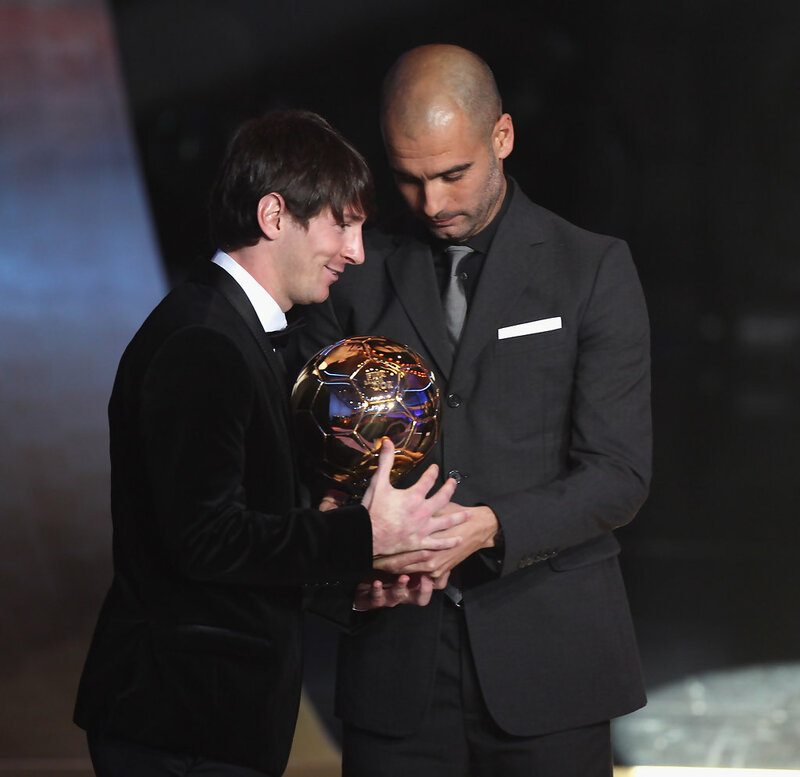 Five time winner of the FIFA Ballon d’ Or could Messi win more individual accolades playing his football at the Etihad? With City freeing up millions of pounds on their wage bill this summer with the likely departures of Joe Hart, Eliaquim Mangala, Samir Nasri, Wilfried Bony, Fabian Delph, Jesus Navas, Gael Clichy, Bacary Sagna, Pablo Zabaleta, Yaya Toure, Fernando and doubts in some quarters against Vincent Kompany, Kelechi Iheanacho, Aleksander Kolarov, Willy Caballero and – God Forbid – Sergio Aguero, City will have massive scope for huge expenditure. Outgoing & Incoming – as Joe goes could Lionel be arriving in Manchester? It’s beginning to look that the once unthinkable prospect of Lionel Messi playing his club football in anything but Barcelona’s colours, is now very much in the thoughts of both the Barca and Manchester City hierarchies. Now, isn’t that some sky blue thinking on which to ponder? 1st of April David ?? That's true, but so might this story be - let's see what happens this summer! If this isn't an April 1st posting ! it is a mouth - watering prospect. A strike force of Messi and Aguero is a definate Wow. If it is a case of Messi but no Aguero then perhaps my enthusiasm would diminish a bit. With Sergio we know that next season we are guaranteed 20+ goals whereas Messi would, as always happens, take time to adapt to the Prem. However (if it comes off) it is a transfer, along with good proven defenders coming in, that should propel City to a new level along with the commercial benefits it will bring. Not footy related but why someone with the wealth he must have is involved in Tax issues is beyond my comprehension but I guess he ain't the first and won't be the last. City are probably the only viable option for Messi given he wants away from Spain. Money of course is no option but we will need another £200 million to overall the remainder of the squad to ensure we can remain in contention on all fronts next year. Totally agree Phil, especially with the Barcelona connections at the Etihad. We have the finance, the infrastructure, the personnel, the relationships and the ambition. Irrespective of it being April 1st, we have the wherewithal to do this deal and still have plenty of funds for Pep to reshape the defence and goalkeeper corps, plus adding to the attack. KTF ;-) Thanks buddy. For me, its too much of a gamble. Yes, his talent is undeniable but it doesn't mean he'll settle in the Premier League. Plus, it's not as if we're close to being a complete side that requires the jewel in the crown. We need a complete reshaping and he's not the sort of player to form part of a rebuilding process. We'll differ on this one CWK - he's truly world class and easily has three years at the top top level left in the tank. He's never relied on speed and with the likes of Sane, sterling and other young guns coming through he could be integral in seeing Pep take City to the very very top table of European football. I would love this to be true, but at age 30 is he really worth that much for two or three seasons at the most? He'd pay us back in spades with goals and assists on the field as well as huge commercial spin offs. What price two Champions Leagues and a couple of Premier League titles in 'two or three seasons'? Complete no brainer for me. Thanks George. I can't disagree with the commercial side of things, but even the great Lionel Messi can't guarantee titles. No guarantees whatsoever, but a greatly enhanced possibility of achieving the success craved by City's owners and fans.